Golvellius - Valley of Doom / Maou Golvellius (魔王ゴルベリアス) - Cheats - SMS Power! Collect all nineteen potions and herbs to become invincible after your energy reaches zero. This will remain in effect until Randar, Enni, or energy pellets are used to refill your life. Hold + + while Kelesis is walking towards the cave in the opening sequence. 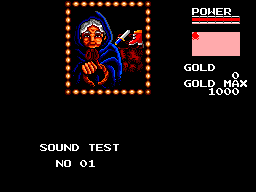 When the old woman gives you the sword, she'll instead be a sound test.